Maroon & green striped readymade churidar kurta set for boys in soft jamawar fabric. 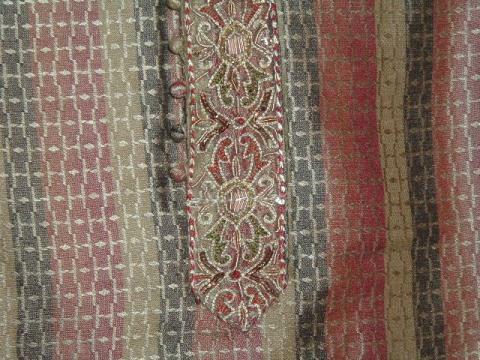 The kurta has maroon & green vertical stripes with design in gold color. It has intricate embroidery on the collar and half way down the front. The churidar (fitted pants/pajama) is green in color. Sizes available for boys aged 3 year olds and up. Buy Boys Jamawar Churidar Kurta In Maroon & Green, sold & shipped by desiVastra.com where you can shop online for Traditional Dress for Baby Boy & Girl, Indian ethnic Wear for Kids. 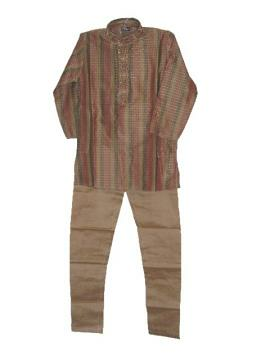 This Kurta Pajama collection has been tagged as kids kurta churidar set, formal indian clothing, kids wear.